California Government Code section 3300 et seq. (d)(1) Except as provided in this subdivision and subdivision (g), no punitive action, nor denial of promotion on grounds other than merit, shall be undertaken for any act, omission, or other allegation of misconduct if the investigation of the allegation is not completed within one year of the public agency’s discovery by a person authorized to initiate an investigation of the allegation of an act, omission, or other misconduct. This one-year limitation period shall apply only if the act, omission, or other misconduct occurred on or after January 1, 1998. In the event that the public agency determines that discipline may be taken, it shall complete its investigation and notify the public safety officer of its proposed discipline by a Letter of Intent or Notice of Adverse Action articulating the discipline that year, except as provided in paragraph (2). The public agency shall not be required to impose the discipline within that one-year period. (b) Based upon his or her reasonable belief that the disclosure of his or her photograph or identity as a public safety officer on the Internet as described in subdivision (a) may result in a threat, harassment, intimidation, or harm, the officer may notify the department or other public agency to cease and desist from that disclosure. After the notification to cease and desist, the officer, a district attorney, or a United States Attorney may seek an injunction prohibiting any official or unofficial use by the department or other public agency on the Internet of his or her photograph or identity as a public safety officer. The court may impose a civil penalty in an amount not to exceed five hundred dollars ($ 500) per day commencing two working days after the date of receipt of the notification to cease and desist. No public safety officer shall be required or requested for purposes of job assignment or other personnel action to disclose any item of his property, income, assets, source of income, debts or personal or domestic expenditures (including those of any member of his family or household) unless such information is obtained or required under state law or proper legal procedure, tends to indicate a conflict of interest with respect to the performance of his official duties, or is necessry for the employing agency to ascertain the desirability of assigning the public safety officer to a specialized unit in which there is a strong possibility that bribes or other improper inducements may be offered. 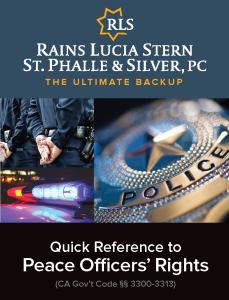 (b) The superior court shall have initial jurisdiction over any proceeding brought by any public safety officer against any public safety department for alleged violations of this chapter. (1) In any case where the superior court finds that a public safety department has violated any of the provisions of this chapter, the court shall render appropriate injunctive or other extraordinary relief to remedy the violation and to prevent future violations of a like or similar nature, including, but not limited to, the granting of a temporary restraining order, preliminary, or permanent injunction prohibiting the public safety department from taking any punitive action against the public safety officer. (2) If the court finds that a bad faith or frivolous action or a filing for an improper purpose has been brought pursuant to this chapter, the court may order sanctions against the party filing the action, the parties attorney, or both pursuant to Sections 128.6 and 128.7 of the Code of Civil Procedure. Those sanctions may include, but not be limited to, reasonable expenses, including attorney’s fees, incurred by a public safety department, as the court deems appropriate. Nothing in this paragraph is intended to subject actions or filings under this section to rules or standards that are different from those applicable to other civil actions or filings subject to Section 128.6 or 128.7 of the Code of Civil Procedure. (d) In addition to the extraordinary relief afforded by this chapter, upon a finding by a superior court that a public safety department, its employees, agents, or assigns, with respect to acts taken within the scope of employment, maliciously violated any provision of this chapter with the intent to injure the public safety officer, the public safety department shall, for each and every violation, be liable for a civil penalty not to exceed twenty-five thousand dollars ($ 25,000) to be awarded to the public safety officer whose right or protection was denied and for reasonable attorney’s fees as may be determined by the court. If the court so finds, and there is sufficient evidence to establish actual damages suffered by the officer whose right or protection was denied, the public safety department shall also be liable for the amount of the actual damages. Notwithstanding these provisions, a public safety department may not be required to indemnify a contractor for the contractor’s liability pursuant to this subdivision if there is, within the contract between the public safety department and the contractor, a “hold harmless” or similar provision that protects the public safety department from liability for the actions of the contractor. An individual shall not be liable for any act for which a public safety department is liable under this section.